The EGO Power+ 15 in. String Trimmer is the next, big step up in power and convenience for cordless string trimmers. The 15 in. cutting swath and extended aluminum shaft make for efficient trimming around your yard. The EGO Power+ 15 in. String Trimmer delivers the performance of gas without the noise, fuss and fumes. The EGO 56V 15 in. Brushless String Trimmer is compatible with all EGO 56-Volt Arc Lithium Batteries (available separately). The EGO Power+ String Trimmer sets a new standard in the string trimmer category, performing equal to or better than premium gas-powered models. The first-ever 56-volt lithium-ion battery has 40 percent more power than the leading 40-Volt battery. It is removable and fits all EGO tools. Up to 45-minute run time with 56-Volt battery 2.0Ah included. A 12 in. cutting swath for efficient trimming around your yard. The EGO power+ blower delivers the performance of gas without the noise, fuss and fumes. The 8 inch brushless edger and power head is part of the EGO POWER+ Multi-Head System. The 8 edger creates clean and precise edges around your driveway, sidewalks and patio with ease. The Multi-Head is compatible with all EGO Multi-Head attachments. Equipped with a variable speed trigger, a lock off switch and a guide wheel with a depth adjustment knob. 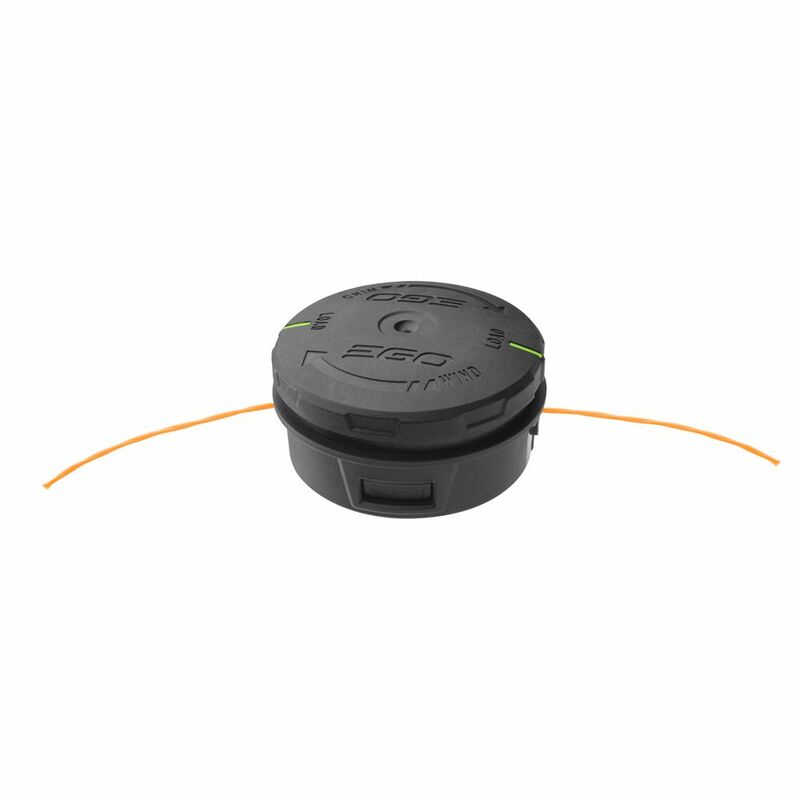 The EGO String Trimmer Spool is a replacement cutting-line spool for the EGO 15 in. Brushless String Trimmer, model numbers ST1501-S and ST1500-S. It is factory-wound with heavy duty twisted nylon line for reliability and convenience. The spool has an integrated bump feed for hassle free trimming. The EGO POWER+ Hedge Trimmer delivers performance equal to or better than many premium gas-powered models without the noise, fuss and fumes. 24-inch hardened-steel, dual-action, blades and extended reach provide a smooth cut that promotes plant health. 3,000 strokes per minute (spm) make clean, fast cuts to get the job done faster. 15-inch String Trimmer Rapid Reload Trimmer Head The EGO Power+ 15 in. String Trimmer is the next, big step up in power and convenience for cordless string trimmers. The 15 in. cutting swath and extended aluminum shaft make for efficient trimming around your yard. The EGO Power+ 15 in. String Trimmer delivers the performance of gas without the noise, fuss and fumes. The EGO 56V 15 in. Brushless String Trimmer is compatible with all EGO 56-Volt Arc Lithium Batteries (available separately). 15-inch String Trimmer Rapid Reload Trimmer Head is rated 3.8 out of 5 by 58. Rated 5 out of 5 by Arthur from Yes, just the right part.... Yes, just the right part. Rated 5 out of 5 by Barbara from Easy to replace. Now works like a charm.... Easy to replace. Now works like a charm. Rated 1 out of 5 by HomeDepotCustomer from It does not fit.... It does not fit. Rated 5 out of 5 by SteveMiller from Seems as good or better than original head. Instructions... Seems as good or better than original head. Instructions were clear and install was easy.